The best time to go see Lombard Street is during either spring or summer or maybe even both! 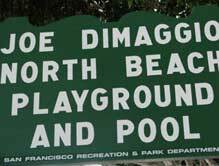 North Beach Park, also known as Joe DiMaggio Park, is equipped with 3 tennis courts, 2 basketball courts, and 1 play structure. When it comes to tennis, people sure like to play it. Most of the time, all 3 courts are taken so if you plan on playing there, I would bring some music to listen to while you’re waiting for a court. Although it may be a long wait, it’ll be worth it since it’s really fun, getting good exercise, plus it’s free! I’ll let you in on a little secret, out of all the three courts, the court at the far end is the best one. Why you may ask, because it’s shady. With the other two courts, they have the sun just beaming down on them and it gets extremely hot. The last court isn’t too cold or too hot, it’s just right. 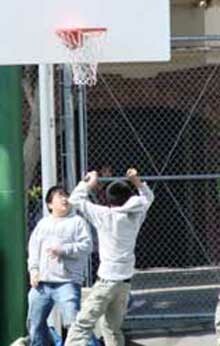 Like the tennis courts, the basketball courts are also always taken. 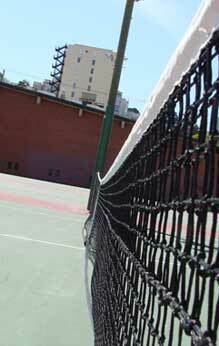 Unlike the tennis courts, there’s no shade on the courts, but there is a resting area with shade. If you’re just with a handful of people and want to play basketball, it’s highly likely that you’ll have to share the court, but no worries, the people are friendly. 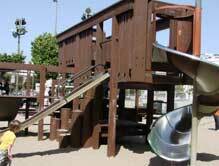 As for the play structure, a lot of young kids play on it. On the play structure, it has 4 slides, 1 ladder, and a whole bunch of other things to climb. There are also 2 sets of swings, 2 different types of monkey bars, and a little playhouse. It still doesn’t end here. Located right next to the park is the library, so once you’ve had enough fun in the sun, sit down, relax, and pick up a book. Lombard Street is known as “the crookedest street in whole world!” You may wonder why this street is so crooked. Well, because that block was just so incredibly steep, it would have been really dangerous for vehicles to drive down this 27 degrees block. So between 1922 and 1923, Lombard Street transformed into a switchback with 8 sharp turns. Cars can only drive downhill and the speed limit is 5 mph so no speeding! 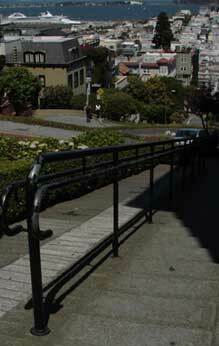 But if you don’t have a car, there’s still ways to experience what Lombard Street has to offer. One way is to take a very long and tiring walk up the street through the stairs at the sides of it. You may not want to walk, but you will get to see the action up close, kind of like a front row seat to a sports game. If you really don’t want to walk up all those stairs, you can take the easy way out and ride the Hyde Street cable car up there. The best time to go see Lombard Street is during either spring or summer or maybe even both! During that time, beautiful chrysanthemums as well as other well intended followers are in full bloom. What a marvelous sight to see! People come from all over the world to see this interesting street. The tourists love it, the neighbors enjoy the energy, and best of all, the whole neighborhood becomes alive with happiness, laughter, joy, and maybe even a few drops of sweat. So come see this marvelous street, and be a part of this excitement! HUNGRY?! 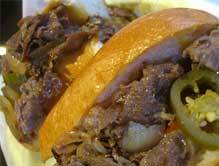 Craving for a Philly Cheese steak? 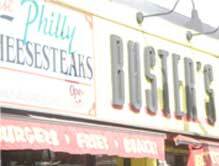 If you are then you should go to Buster's. 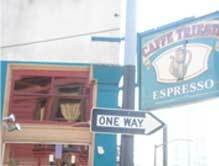 It is located in San Francisco's North Beach District on the corner of Columbus and Vallejo. Buster's is a good place to go for lunch or for dinner with yummy burgers, hot dogs, pizzas, and fries eaten garlic, cheese or have it plain. Either way it's yummy. If you want more of a Italian flavor there are always all the cafes on Columbus Street from down on Broadway until Stockton Street where you can get a cup of espresso, some tiramisu, gelato, panini, and of course a cannoli. Little bakeries here and there where you would find the freshest bread and breadsticks on Grant Avenue and of course a lot of corner stores where you can find all your daily necessities. Fog Hill Market up on the Green Street and Kearny where you can get a snack or if you don't want to cook you can always buy some sandwiches that are made fresh daily or if you want something really simple you can always get a corndog served with mustard and ketchup. If you rather just have a cup of coffee or espresso you should go to Cafe Trieste on the corner of Vallejo St. and Grant Avenue. 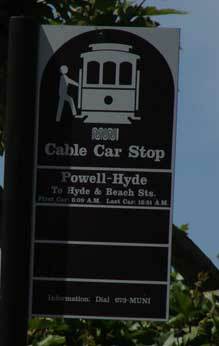 If you really don’t want to walk up all those stairs, you can take the easy way out and ride the Hyde Street cable car up there. Buster's is a good place to go for lunch or for dinner with yummy burgers, hot dogs, pizzas, and fries eaten garlic, cheese or have it plain.